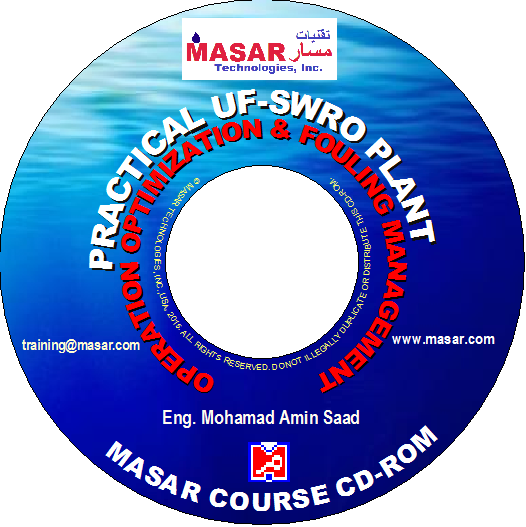 MASAR Intensive Training Course CD-ROM is based on an 8-hour course conducted recently by Mohamad Amin Saad, President, Principal Consultant & Trainer of MASAR Technologies, Inc., USA, with 35 years of technical expertise, plant experience and training of hundreds of industry and plant professionals in the water desalination and membrane technology industry worldwide. The easy to navigate CD contains hundreds of course presentation slides, references and publications. The main focus of the course is identification, measurement, troubleshooting and management of membrane fouling in real time with various case histories, diagnostic tools, techniques and practical lessons learned in the field at tens of SWRO plants using either conventional or UF pretreatment systems. Order by January 31, 2019, and we will include a printed Course Workbook with the CD.